Located centrally in Orchard is multiples award-winning The Quincy Hotel by Far East Hospitality. Having snagged awards including the World Luxury Hotel Awards (2012-2013), Business Traveller Asia-Pacific Awards (2012), TripAdvisor Travellers Choice Awards (2011-2013) and the TTG Asia Travel awards (2013), the stylish boutique hotel is perfect for business and leisure travellers. 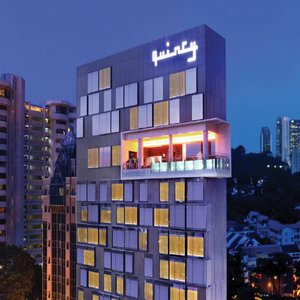 Featuring modern amenities and cutting-edge room design, with a well-equipped 24-hour gym and sauna, an LED-illuminated infinity pool that overlooks the city from its 12th floor vantage point and a concept lobby restaurant that serves light refreshments all day. The hotel features progressive technology, with iMac stations in the lobby and keycard-restricted access to the hotel for added security. The rooms offer captivating city views, and provide guests with premium comfort in the form of 400-thread-count bedsheets, feather pillows and luxurious bathroom amenities by Molton Brown. A Nespresso coffee machine, iPod dock and 42-inch flat panel cable TV complete the list of impressive features. The signature All-Club Benefits package means all Quincy guests get Club treatment, including one-way airport transfer, all-day light refreshments by Dean and DeLuca, complimentary mini-bar and free Wi-Fi.